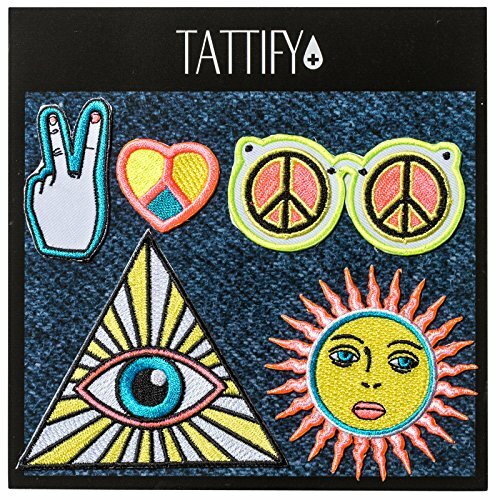 Tattify’s Patch Sticker Sets – With an adhesive backing on all of our STICKER patches, they can be placed anywhere: cell phone cases, shoes, hats, bikes, backpacks… The possibilities are endless! Alternately, they doube as iron-on or sew-on.WHAT YOU GET: A complete set of 5 high quality, trendy and cool cotton and polyester sticker patches. Spice up your clothing and accessories with bright, sharp and colorful patches. Completely unisex. Perfect for school kids, adults, creatives, vintage enthusiasts, hippies and punk rockers. Don’t wait any longer – Now’s the time to personalize your belongings! – Order Now!